Nothing better illustrates the ability of epidemiological studies to lead us astray than when a medical journal publishes two null studies in the same issue: an epidemiological study suggesting a “causal relationship” and a randomized, controlled clinical trial that actually tests the hypothesis. Invariably, it’s the epidemiological study - suggesting some worrisome risk, or magical preventative, for a disease - that comes with the press release and receives the media attention. All studies are not the same or hold similar value, of course, but even untenable correlations from epidemiological studies can seem so convincing and intuitively correct, even healthcare professionals can be taken in. We saw that this week with vitamin D and hypertension, which we’ll look at in an upcoming article. Today, at readers’ requests and in honor of World Diabetes Month, we’ll look at claims that sugar causes type 2 diabetes and that ‘healthy eating’ can prevent type 2 diabetes. The July issue of Archives of Internal Medicine published two null studies. The epidemiological one wasn’t reported as a null study, however, and it was also the one that got all of the attention. It supported popular ideas on what we should eat. In contrast, the largest, longest randomized, dietary intervention clinical trial in the history of our country that tested the dietary hypothesis was ignored and rationalized away. No matter how much clinical research on humans for more than half a century has continued to show that sugar doesn’t cause any chronic disease of aging and no credible link has ever been shown to cancer to type 2 diabetes, fears of sweeteners and carbohydrates have continued for centuries, although the specific demon of the day has changed over the years. You can't give yourself cancer or diabetes by eating sugar, just as eating less sugar won't prevent cancer or diabetes. Epidemiological studies — that observe correlations among groups of people — are the source for the vast majority of food fears, as well as popular beliefs in the near magical merits or perils of certain foods or nutrients. These types of studies are also the most easily manipulated by biases and likely to be flawed. Correlations can never provide evidence of cause, no matter how compelling they might seem. As it turns out, specific foods or diets are usually markers for things that are really behind the correlations to people’s health — like poverty or affluence, genetics/heredity among a population, age, and social stress factors. Failing to account for confounding factors makes these types of studies most easily misinterpreted by unsuspecting consumers or by those trying to market some food or diet. Take aging, for example. A common fallacy, often used by those trying to make us feel afraid of modern foods and to promote some type of diet eaten in past eras or in less developed regions of the world, is to conclude that these foods are healthier because they’re associated with populations that have lower rates of obesity, heart disease, diabetes or cancers. They neglect to mention that those peoples live a fraction as long as we do — more people in their populations don’t live long enough to develop conditions more common with advanced aging. Less developed and more economically-deprived populations also typically suffer more infectious diseases and even undernutrition, and don’t see the natural age-related increases in body weights. Comparing populations is especially problematic because lots of confounding factors can be glossed over, including heredity/genetics and the homogeneousness or diversity of a group. Other times, an epidemiological study may correlate eating a food or diet to surrogate endpoints like a health risk factor (another correlation), rather than actual clinical outcomes. Epidemiological studies, especially large data dredges, are also more rife with weaknesses in the quality of the information in the databases used, which is often unverified and compiled from questionnaires or telephone surveys. That’s why these types of studies are designed to be used to help find links to begin to formulate hypotheses that, if they hold biological plausibility, are then put to the test in randomized, controlled clinical trials. A study by Boston epidemiologists published in this issue reported that “sugar-sweetened soft drinks and fruit drinks is associated with an increased risk of type 2 diabetes mellitus in African American women.” It was a data dredge which used the Black Women’s Health Study database. This database was launched in 1995, recruiting 59,000 Black women subscribers of Essence Magazine and their friends and relatives who filled out questionnaires and returned them in the mail. The women, average age about 38, were asked their height, weight, demographics, medical history, smoking and drinking habits and about their diet. Five follow-up questionnaires that included self-reported illnesses were mailed to them every two years. The authors got back 80% of the questionnaires. These authors excluded 15,000 women for missing or improbable information, those who reported diabetes, heart attacks or strokes or cancer in 1995, leaving 43,960 questionnaires. For the paper published in Archives of Internal Medicine, the Boston authors, led by Julie R. Palmer, ScD, at Boston University, used 3 questions from the food frequency questionnaires that the women had filled out in 1995 and again in 2001. These questions had asked them how often they drank regular soft drinks, orange or grapefruit juice, and other fruit juices or drinks. The Boston authors arbitrarily divided the drink consumptions into three categories: <1 serving/week, >1 serving/week, and 2-6 servings/week. They then used computer modeling to look for correlations with the 2,713 cases of diabetes that had been self-reported during the ten years. Only 219 cases of type 2 diabetes were confirmed by physicians of a random sample of 657 requests for medical releases sent out. The first thing one notes when reading the study is that the women in the various soft drink categories differed in many ways. The women drinking more than one soft drink a week, for example, were more likely to have a family history of diabetes, to smoke, be less physically active, have achieved lower levels of education (reflecting socioeconomic stresses), etc. In other words, a correlation between those in the highest and lowest drink categories could reflect contributing factors related to other differences. But it didn't matter in the end. The authors then compared the relative risks between the consumption categories associated with self-reported type 2 diabetes. They were unable to find a single tenable relative risk associated with type 2 diabetes and any of the types or amounts of sweet drinks the women consumed, even when stratified by age, BMI and family history. Not one of the correlations were beyond random chance, statistical error and confounding factors. Compared to the <1 soda/month category, the adjusted relative risks (RR= 0.89-1.31) in each of the other drink categories all hugged either side of null (1 report of diabetes in group A to 1 report of diabetes in Group B =1) with no dose response to the soft drinks. For example, the women drinking seven sodas a month had lower relative risks than the women drinking less than one a month; and the women drinking six sodas a week had the same relative risks as those drinking less than one a month. Regular consumption of sugar-sweetened soft drinks and fruit drinks is associated with an increased risk of type 2 diabetes mellitus in African American women. While there has been increasing public awareness of the adverse health effects of soft drinks, little attention has been given to fruit drinks, which are often marketed as a healthier alternative to soft drinks. Which study was plastered all over the news: this data dredge or the randomized clinical trial published in the same journal 8 pages later? In the same issue, the results of the Women’s Health Initiative randomized, controlled dietary modification trial for the primary prevention of treated diabetes were published. Billions of tax dollars are spent on government and private nutrition-related programs, said to prevent the chronic diseases of aging that are main causes of death, and reduce obesity. But conflicting information about what makes healthy eating abound. So in 1992, the National Institutes of Health and U.S. Department of Health and Human Services launched the largest preventive health study in our history, the Women’s Health Initiative. One part was the WHI Dietary Modification Trial — one of the largest, longest and most expensive randomized, controlled clinical dietary intervention trials in the history of our country. It was specifically designed to provide the strongest, most indisputable evidence in support of its ‘healthy eating’ guidelines for the primary prevention of chronic diseases and for weight control. According to the NIH, it was “one of the largest studies of its kind ever undertaken in the United States and is considered a model for future studies of women’s health.” It was a major undertaking, costing $415 million and conducted at 40 medical centers across the country. It was a well-designed and carefully conducted study. A total of 48,835 postmenopausal women (the age most associated with risks for developing heart disease and cancers) were enrolled and received extensive physical work-ups, labwork, and dietary assessments at baseline, year one, and every three years. They had clinical follow-ups every 6 months and their medications were monitored in a pharmacy database. At the start of the trial they were randomly assigned (with each group exceedingly well matched in every index and risk factor) to either their regular unrestricted diet or to a “healthy” diet and lifestyle program. The WHI dietary intervention group received intensive nutritional and behavioral modification training consisting of 18 group sessions in the first year followed by quarterly sessions throughout the trial. Each participant received an individualized dietary fat gram goal estimating 20% of energy from fat during the intervention and a common dietary goal of 5 or more servings daily of combined vegetables and fruits and 6 or more servings daily of grains. Self-monitoring techniques and group session attendance were emphasized. While the intervention group backslide a little, they did surprisingly well in sticking to the diet — as good as dietary prescripts will ever get and money can buy — at a cost of $8,498 spent per person. The women in the healthy eating intervention group cut their total fat intakes down to 24% of their calories and 8% saturated fat the first year — well below the control group eating about 38% total fat and nearly 40% more saturated fats. By the end of the study, the healthy eaters were still averaging 29% fat, compared to 37% in the control group. The ‘healthy dieters also ate about 25% more fruits and vegetables, grains and dietary fiber than the typical American diet of the control group. Throughout the trial, the dieters continued watching what they ate and consumed fewer calories, about 361 kcal/day less than they had been eating at the start of the study. Right up to the end of the 8 years of follow-up, researchers remained confident that their trial design and the dietary changes these participants made, while not perfect, were significant enough to prove that following a healthy lifestyle and healthy diet leads to weight control and lower rates of chronic diseases. They confidently projected a 14% decrease in breast cancer, for example. After eight years, there were no significant differences in the incidences of more than 30 clinically-documented cancers, heart attacks or strokes, or all-cause mortality. The dieters initially lost some weight but rebounded and their body weights, despite 8 years of watching what they ate, were no statistically different from the women who’d been eating whatever they wanted. Both groups ended up at nearly the identical weights they started with, differing a mere 0.7kg, about one pound. No one was happy with the null result of this major clinical trial. No one. The healthy eating interests didn’t like it. The low-fat advocates didn’t like it. The low-carb advocates didn’t like it. The weight management programs didn’t like it. Everyone diligently set out to spin it, downplay its results, or not call any attention to it, no doubt hoping it would quietly go away. According to the WHI researchers, a total of 3,342 new cases of treated diabetes were reported: 7.1% (0.88%/year) in the intervention group and 7.4% (0.91%/year) in the control group during 8.1 years of follow-up. No statistical difference. While self-reported diagnoses for diabetes were used, medication use was confirmed for most of the cases, and 93% of both groups were being followed personal physicians and both groups had received annual physical exams throughout the 8-year study. As the authors noted, this trial’s findings may have differed from others, such as the Diabetes Prevention Program, because its goals were to specifically analyze the effects of changes in diet composition. In contrast, among the high-risk population in the DDP study, weight loss most accounted for the transient changes in reduced risk. In the WHI, there was no tenable difference in risk for diabetes among the different BMIs, with odds ratios even slightly higher for women with BMIs<25 and slightly lower among those in the overweight and obese categories. With dietary assessments on more than 48,000 women, and wide variations in their diets, the authors analyzed the various dietary components to parse out effects from any particular dietary component. 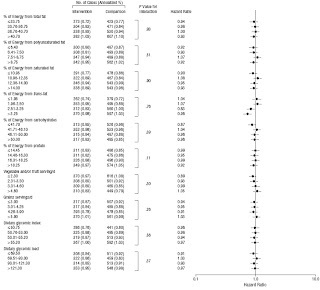 These subgroup analyses provide some of the most interesting information, and is probably the least popular aspect of the trial among those who believe some special food is good or bad. Controlling for confounding factors and weight fluctuations, there was no statistical, or dose-related, difference in risks for developing diabetes between the different consumptions of total fat (%), polyunsaturated fats, saturated fats, trans fats, carbohydrates, protein, servings of fruits and vegetables, or the servings of grains. “Glycemic index didn’t differ to a biologically significant degree between the [control] and intervention groups at baseline, year one, or year six,” they reported. Dietary glycemic load, while slightly higher in the intervention group at years 1 and 6 was not associated with risk of diabetes. Fasting blood glucoses — whether greater than 98 mg/dl (often called “prediabetes”) or below 90 mg/dl —were unrelated to the risk of developing type 2 diabetes. What may be especially surprising is to learn that evidence for the ability of healthy eating or any special diet to prevent diabetes is even sparser than that for the dietary management of type 2 diabetes, reviewed here. 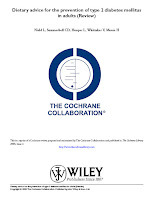 Two Cochrane Collaboration systematic reviews of randomized clinical trials on dietary interventions for the prevention of type 2 diabetes in adults were issued this past July. After reviewing nearly 9,000 studies between them (most of which turned out to not be randomized clinical trials), both reviews were unable to find a single trial that had examined the effects of diet alone or compared various diets. Additionally, “we are not aware of the existence of any systematic reviews addressing the impact of dietary advice alone on the prevention of type 2 diabetes,” Dr. Lucie Nield at the School of Health and Social Care at the University of Teesside in Middlesbrough, UK, and colleagues stated. There have been no studies conducted on the general population examining a healthy diet, regardless of how that might be defined, to see if it actually prevented the development of type 2 diabetes. A close examination of the only five quality dietary preventive studies identified by the Cochrane review, which included two large diabetes prevention trials, revealed that, just as they noted, none were actually primary prevention trials. They all had problematic high-risk of biases and confounding factors, such as including only high risk populations already identified with impaired glucose tolerance and fasting glucoses; they studied weight loss diets and exercise; were short-term; and measured surrogate endpoints while failing to show improved hard clinical outcomes. The diet and exercise studies, for instance, measured outcomes of temporary changes in fasting blood sugars which had simply followed the weight loss trajectories, all of which rose with the predicted weight regain and the studies ended before the full regain had been realized. But, of course, blood sugars are a symptom and not the underlying disease process of diabetes. Most importantly, according to the Cochrane Collaborative, none of the diet, or diet and exercise, clinical prevention trials had reported any benefits in morbidities, such as cardiovascular disease-related events, quality of life or mortality. With everybody trying to scare us about our food and market their idea of how best to eat, the most healthful thing for us is sound science. Understanding that not all studies are created equal and that few in the news actually tested anything or even deserve our attention; learning to not let relative risks and untenable correlations get our goat; realizing correlations (risk factors) don’t make causations; and appreciating null studies, is the best defense against being taken advantage of, or harmed. Sound information can most help us not live in fear of our food or for our health. We’re surrounded by news, claiming that our diets and those of our children are deplorably unhealthy and that we’re eating so much junkfood it’s created a national health emergency, necessitating far-reaching government interventions. The facts tell a totally different story. Even the government’s own best data of our diets and those of young people fail to support any of the doomsday claims.